This video is a clip of a BBC documentary in which Iain Chalmers and Dan Cruikshank recreate James Lind’s celebrated experiment to test treatments for scurvy. The video is available on the James Lind Library website. 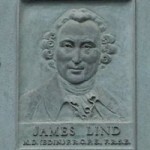 The page also contains other material commemorating James Lind, including a postage stamp and commemorative plaque erected by the Citrus Growers of California and Arizona. Which facts did he do? In the 1700s, more British Navy sailors died from scurvy than from enemy action. In short, James Lind discovered that you could prevent scurvy by giving sailors oranges and lemon to eat whilst they were at sea. What was particularly notable about this was that he did so by conducting one of the first ever clinical trials to test how well different treatments work. Watch the video, and if you want to read more, there are lots of essays about the importance of his contribution on the James Lind Library website linked above.